The Natural Resources Division (NRD) of the Colorado River Commission of Nevada (CRC) is responsible for protecting the rights and interests of the State of Nevada’s allocated share of Colorado River water. The CRC represents the state through participation in local, state and federal water and environmental programs that directly or indirectly touch the Colorado River. In an effort to create additional water supplies and protect Nevada’s entitlement from competing claims, waste and environmental degradation, the staff of the NRD works closely with U.S. Federal agencies, numerous interstate agencies including both the Upper and Lower Colorado River Basin States, environmental agencies, stakeholders and various other public and private entities. 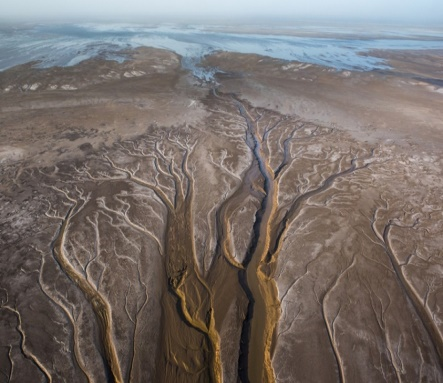 The Colorado River is one of the most highly regulated rivers in the world. It flows through portions of seven states and Mexico before discharging into the Gulf of California. The Colorado River is managed and operated under numerous compacts, federal laws, court decisions and decrees, contracts and regulatory guidelines collectively known as the “Law of the River” (http://www.usbr.gov/lc/region/g1000/lawofrvr.html). The NRD works to protect the resource assets of Nevada that are derived from the “Law of the River” construct by ensuring that Nevada’s interests are considered in decisions that may have an impact on overall Colorado River operations. The Natural Resources Division of the CRC serves a very important function by ensuring that the water allocated to the state is used properly, and the state is well represented on all federal, state and local water and environmental programs that touch the Colorado River, specifically the Lower Basin. The Secretary of the Interior, acting through the U.S. Bureau of Reclamation serves as the Water Master, providing sole contracting authority for Colorado River water use in the Lower Basin. The NRD staff is responsible for calculating Nevada’s consumptive annual use of Colorado River water in accordance with Article V of the Consolidated Decree of the United States Supreme Court Arizona vs. California 1964 (373 U.S. 546) as amended. Nevada is entitled to consumptively use 300,000 acre feet of water a year. Through both voluntary and mandatory conservation and recycling efforts, Southern Nevada has been able to maintain its consumptive usage at or below its allocated amount. Southern Nevada Water Authority (SNWA) is responsible for treating and delivering water to customers in the Las Vegas Valley. 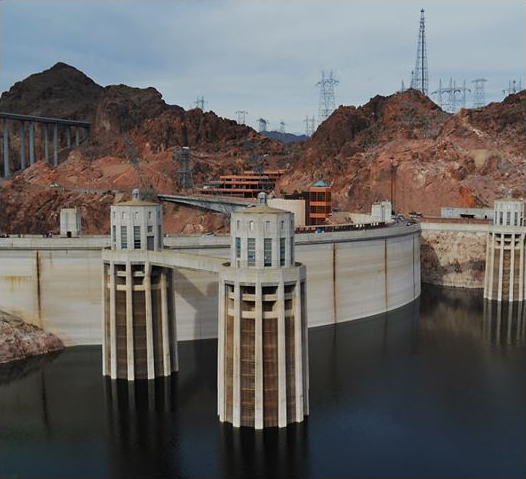 When Colorado River water is returned as wastewater for treatment, it is then discharged into the Las Vegas Wash, and the State of Nevada receives Return Flow Credits as the water makes its way back to Lake Mead. These Return Flow Credits allow Nevada to divert a larger amount of Colorado River water than the 300,000 acre feet each year. Each month, the NRD calculates a Return Flow Credit Report using records of Colorado River water used by each agency and the amount of Colorado River return flow in the Las Vegas Wash. In addition, the CRC actively participates in water planning and storage of Nevada’s unused apportionment of Colorado River water in Arizona and/or California water banks. This information is vital as the Lower Basin States balance the supply of water with demand of this critical natural resource, especially in years of drought. The Colorado River Basin has experienced severe dry conditions for over a decade. In 2007, the Lower Basin States adopted the 2007 Interim Guidelines that set specific operating criteria for Lakes Powell and Mead during shortage conditions. During the 2012-13 critically dry water years, it was recognized that additional tools were needed to address the ongoing dry conditions. The Basin States continue to collaborate on efforts to protect system reservoir elevations to reduce the likelihood of any interruptions in water service due to drought. The population in Southern Nevada has grown considerably over the last two decades, and this growth is expected to continue into the future. SNWA has implemented several conservation measures that are intended to preserve the use of Colorado Water for future use. The CRC, on behalf of the State of Nevada, and SNWA work with federal agencies and the other Basin States to minimize the impact of drought. 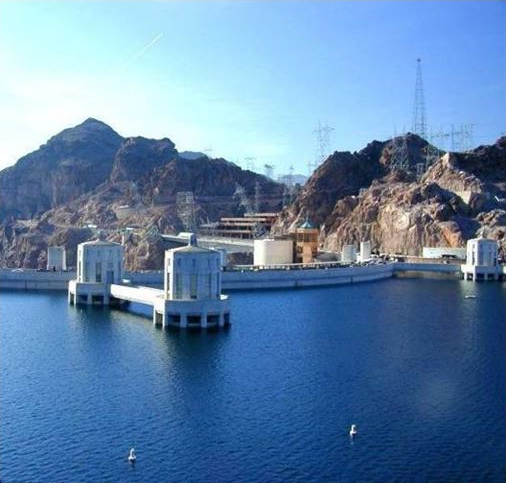 Water conservation programs developed in the 2007 Interim Guidelines have allowed Nevada to create and store additional resources in Lake Mead. The CRC is working to develop new programs and partnerships that will protect water resources and minimize the impact of a continuing drought. In 1944, the U.S./Mexico Water Treaty was created which allocated 1.5 million acre feet (maf) of Colorado River water to Mexico. The treaty brought the International Boundary and Water Commission (IBWC) into existence which is a governing body consisting of representatives from both countries. 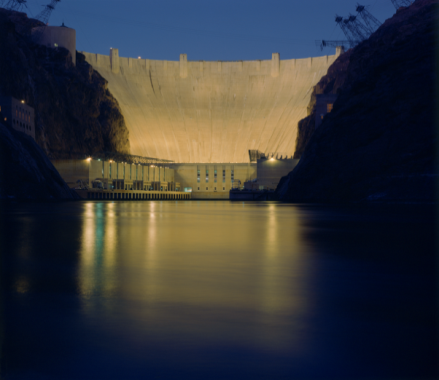 The Salinity Control Program was created with the passage of the Colorado River Basin Salinity Control Act (1974) with the purpose of improving water quality above Imperial Dam. The Salinity Control Forum (Forum) is comprised of the Department of Interior, Department of Agriculture, Bureau of Land Management, and members from the Seven Basin States. The CRC, (Executive Director and NRD Staff) is the State of Nevada representative for the Forum. 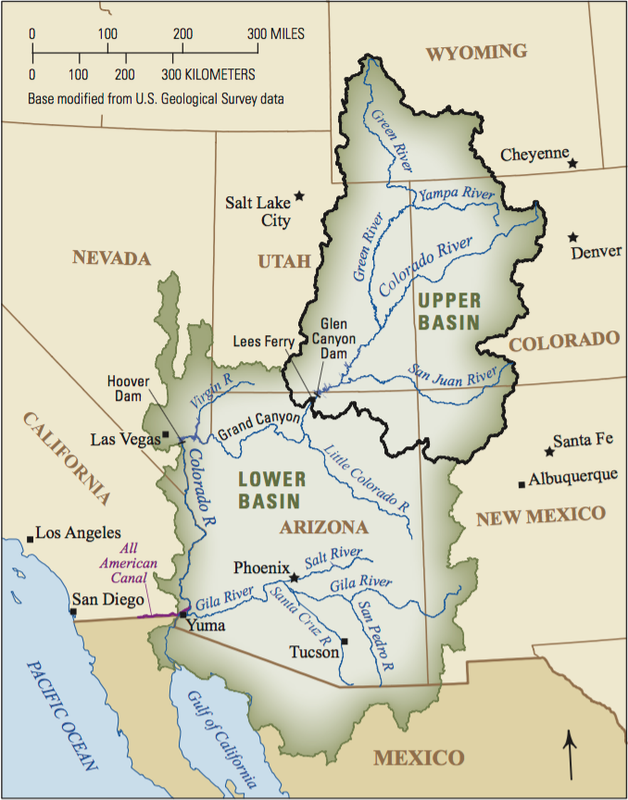 Much of the Upper Colorado River Basin is underlain by geologic formations composed of sediments with high concentrations of salt deposited from ancient inland seas. Water passing through these formations can dissolve and mobilize salts, increasing concentrations in the Colorado River as it travels downstream. Increased salinity concentrations can financially impact water users through decreased crop productivity and reducing the useful life of household fixtures like faucets and hot water heaters. 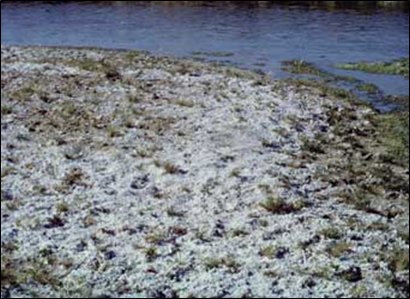 Modeling by Reclamation shows that the quantifiable damages from high salinity water are approximately $382 million dollars per year to U.S. users, with projections that damages could increase to more than $614 million by 2035 if the Program were not to continue to be implemented. Urban and agricultural water users in the Basin States, as well as in Mexico, gain direct benefits from the program. Staff from the NRD serves on the Technical Work Group, which provides the technical analysis of issues and projects for purposes of making recommendations to the Forum. Staff also participates in the various sub-committees that are formed to address specific issues that arise under the program. Reinitiated in 2012 by the Department of Interior (DOI), this process was undertaken to evaluate the impacts Glen Canyon Dam has on downstream resources and to incorporate science-based management to address negative impacts. An Environmental Impact Statement was developed and implemented to provide a framework for adaptively managing Glen Canyon Dam operations and other experimental actions over the next 20 years. It also serves to better inform the DOI of decisions on dam operations and experimental actions while satisfying statutory obligations to protect the downstream resources, including conservation of species listed under the Endangered Species Act. 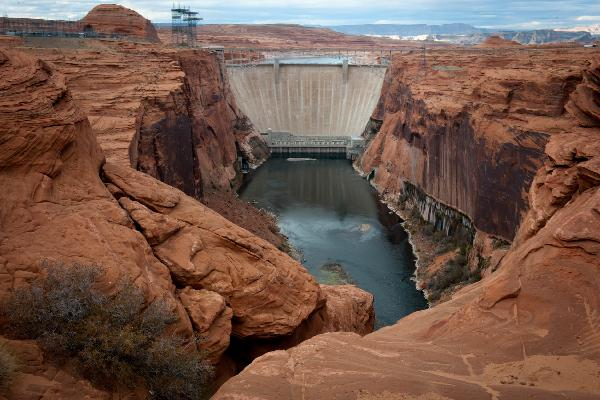 The Adaptive Management Work Group (AMWG), a federal advisory committee on which the Executive Director of the CRC is appointed, includes numerous Colorado River stakeholders with various interests in the operations of Glen Canyon Dam. Staff from the NRD serves on the Technical Work Group (TWG) which provides recommendations to AMWG on issues affecting the implementation of the LTEMP. These recommendations are made to balance the protection of the natural resources and environment with the economic benefits of the Glen Canyon Dam. The LCR MSCP was created to balance the use of Colorado River water resources with the conservation of native species and their habitats. The program works toward the recovery of species currently listed under the Endangered Species Act (ESA). It also reduces the likelihood of additional species being listed. Implemented over a 50-year period, the program accommodates current water diversions and power production, and will optimize opportunities for future water and power development by providing ESA compliance through the implementation of a Habitat Conservation Plan (HCP). NRD staff is responsible for representing Nevada on activities of the LCR MSCP.